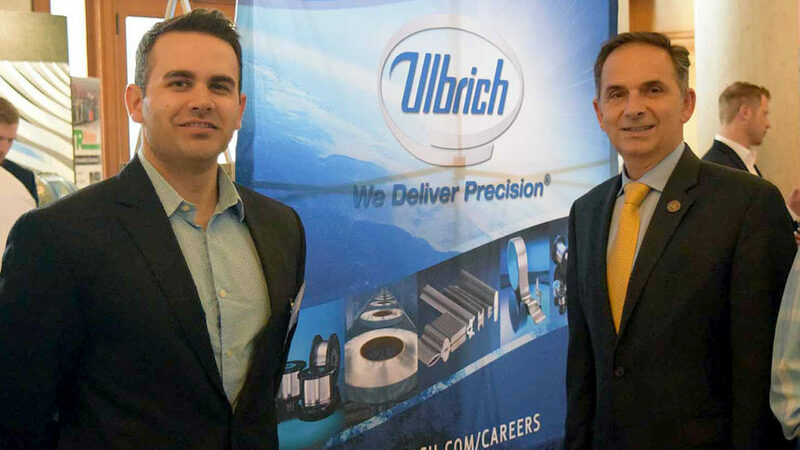 (l to r) Weston Ulbrich, Human Resource Coordinator and State Representative Dave Yaccarino on Wednesday, May 16 during Manufacturing Innovation Day at the State Capitol. State Representatives Dave Yaccarino (R-87) attended Manufacturing Innovation Day at the State Capitol this week. Rep. Yaccarino met with his local manufacturers, Medtronic and Ulbrich Stainless Steels & Special Metals Inc.
Ulbrich Stainless Steels & Special Melas Inc. is a global precision manufacturer and distributor of stainless steel and special metals strip, foil, shaped wire, fine wire, sheet, plate and bar products for use in the medical, automotive, power generation, nuclear and aerospace industries. Manufacturing is a critical component of Connecticut’s economy. Connecticut is home to almost 160,000 manufacturers generating $42.7 billion in economic activity annually. Over 4,000 people are employed by Connecticut manufacturers, earning an average annual salary of $95,118. According to the Connecticut Business and Industry Association, more than one-half of the top 100 companies headquartered in Connecticut are manufacturing firms.